New Propeller Accessory, PropNIC - a Network interface card for your Propeller! I have a new product at uController.com to announce, The PropNIC! This is a ethernet adapter, using the popular ENC28J60 interface IC, for which there exists an object in the Object exchange. 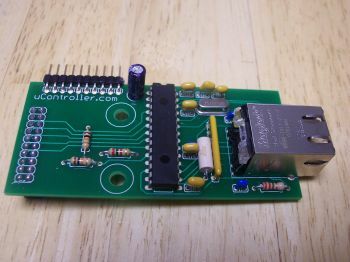 This is the easy and inexpensive way to add ethernet support to your existing Propeller development board, regardless if you use a Propeller Proto Board, The Demo Board, The Propeller Education Kit or any of the other 3rd party development boards. As long as you have 5 free IO pins and access to VDD and VSS, you can use PropNIC! No need to buy one of the more expensive complete development boards, just to get your hands on ethernet capability! Assembly is required, but all components are through-hole, so soldering is not difficult. If you feel unable to assemble this, just let me know, and for a modest charge, I can solder it before shipping for you. Documentation is available now on uController.com for you to peruse. I'll be ordering a batch this week, and they will be arriving the end of next week (around Oct 18th), but I'd like to get an idea of how many I should order. Pre-orders are available now, and they are guaranteed to ship by Monday October 22nd. @ Brian : Is that also the price of shipping to the UK ? Is that also the price of shipping to the UK ? Sure, I see an option for International First Class mail, that is affordable. There is no tracking or delivery confirmation with that option, but it's an inexpensive option. Anyone have experience with how long that takes? Good question though, thank you for bringing that up! — Calvin, of 'Calvin and Hobbes. Cool. Could you communicate with another prop via internet to play games? I wish I had a prop. ON subnum GOTO Hope_this_helps, Thanks!, WOW!! @ Brian : Thanks, that sounds very reasonable. I'd find a delay in delivery far preferable to shipping costs which often exceed the cost of the item itself. AFAIK, if it does get picked-on by Customs, the receiver pays duty, VAT and whatever, demanded on delivery, so hopefully not much more extra work than posting locally. Cool. Could you communicate with another prop via internet to play games? Duty/VAT won't be payable in the UK, as the price is under £33 (I think that is the limit). Postage to the UK could take at least a week. I have a client who wants me to interface an ENC28J60 to an ARM prototype I will be developing. I was going to design my own, but I might as well get yours. Doubt my counter is working right, but you guys appear to have hit my propeller around 100 times over-night. Guys: Order some of these so we can get some prop multi-player internet gaming going!! Something like Battlez0wned would be very cool with a couple of these running over the Internet. well...it's been a couple days, and no pre-orders. I'll be honest, I probably won't have them made if there's no interest. It'd be a shame, I'm proud of this design, and I think it'd be very useful to many of you, but I can't justify having a batch made if no-one has spoke up yet. I'll give it a couple more days and see. What are the differences between your module and the one being discussed here: http://forums.parallax.com/showthread.php?p=680917? The WizNet module is a module that contains custom ASIC with the sole purpose of handling the entire tcp/ip stack on a chip. It also incorporates an ethernet mac/phy layer so that you don't have to use any external NIC chips. This is a great idea, but I really hate all in one chip solutions because the company usually goes out of business, or stops manufacturing the chip. This can cause lots of problems with your products or projects. Brian's module uses the ENC28J60 chip from Microchip. Microchip has been around for a very long time, and produces many other chips and generally gives customers an excellent path to newer models when the current chip reaches EOL. The ENC28J60 chip does not contain any onboard tcp/ip stack handling so it all has to be done on the host controller. This makes it harder, but gives you ultimate flexibility. If I were to choose, I would choose Brian's module over the Wiznet module. Brian's module uses the ENC28J60 which can be easily obtained at low prices from various vendors. It allows you to explore the word of networking while also letting you reproduce your design many times without having to use weird proprietary chips that will reach EOL in a few years. I think the reason why people aren't preordering is because of the learning curve associated with networking. The recent discussion of using a different product that can be obtained for *free* is probably another reason why no one is preordering. I'm sure interest in your module and the ENC28J60 will go up as soon as people figure out the Wiznet is hard to use and is limited (4 concurrent tcp sockets, single sourced ASIC part, high pin count for chip, expensive shipping / cost). The WizNet connector has 2mm spacing, which means it won't plug into a standard solderless breadboard. You'll need some sort of breakout board or custom circuit board made just to plug it in. My board plugs right into a solderless breadboard, or you can solder a simple header onto a protoboard and plug it in, no custom circuit board required! Other existing ethernet implementations for the Propeller use the ENC28J60, if applications are developed for ethernet, such as games, web server, email, browser, etc. Whoever develops those applications is going to choose the platform that most people are using, which is currently the ENC28J60. I see the 2MM header as being the biggest hangup, you wouldn't be able to plug it in without a breakout board, or perhaps soldering wires directly to the pins you want access to. I plan to order one, but I've been busy lately. Perhaps in the next day or two. The more I know, the more I know I don't know.· Is this what they call Wisdom? Brian: I to plan to buy one of your nic boards, but my budget isn't going to let me right now. Please don't give up yet. By the way I wish you could see my prop board sound card,its crude but functional.I had a lil help from oldbitcollector..
and PropNIC added as suggested alternative to the more expensive Xport device. Rumor has it that there may be some interesting .spin code in the works for PropNIC, hang in there Brian! I'm not giving up, just got discouraged. I am going forward with this project. Hopefully as more get into users hands, there will be new code (hopefully a game or 2) that Prop users can play head to head over a LAN or the internet. Or other useful applications (remote datalogging? turn lights/heat/AC on at home from work?) might come along as well. I'm not looking to make a fortune, I just want to at least break even. Someone suggested offering the bare boards for a lower price. I'm not opposed to that, but some parts aren't common stuff that everyone has. Most of it can be purchased from Mouser, but not all. By all means, anyone pre-ordering one would be much appreciated! and I'll keep you all informed as things progress. Harrison, Brian -- Thanks for the information. I've been wondering how many readers of this forum also read the Hydra forum. I guess I should have clarified that when I posted it.. I assume that everyone reads the Hydra forums. No, at least not yet..
set the rest of the configuration the same as my workstations. @OBC: shouldn't be a problem. @Brian: I did pre-order one. I have not received any email confirmation of my order. I did hear from Harrison (the author of the existing ENC28J60 code) he has some plans for new and interesting things once he has his hands on the PropNIC. Also as more get into other users hands, the applications will grow and grow. Over the weekend I plan to add assembly instructions to the documentation, so there will be instructions before the boards arrive. I just posted updated documentation on my website for the PropNIC, It now includes assembly instructions and schematics. An update email was sent to all customers that have pre-ordered. For those of of you that did not pre-order, I have a few left in the first batch. The circuit boards are due to arrive Monday Oct 22nd, all of the other parts are already in hand and kitted, so I just have to drop a circuit board in each bag, and ship. So they ought to ship in Tuesday's mail. The pre-orders have priority, and will leave first. I have a few other SpinStudio modules that I ordered with the PropNIC batch, after the PropNICs ship, I'll let you all know more details about them. Currently there are 7 different plug in peripheral modules for SpinStudio, with 2 more to be announced shortly. Just a quick update. All pre-orders were sent out earlier this week, most in the US should have them by now. I have some more ready to mail immediately. I'll inform if my supply dwindles. Thanks to all that pre-ordered, and i hope you enjoy! PropNIC - Add ethernet ability to your Propeller!